San Diego is one of our favorite cities, for the great year-round climate, the abundance of things to do, the Asian food & groceries, and the lovely scenery. So although we planned just four nights here, it’s not much surprise that we decided to extend the stay to six nights. We’ve been busy. Each day I work a few hours, starting around 7 or 8 a.m., and then we head out in the afternoon to do the fun stuff. On Monday we picked up Brett at the airport and immediately headed to a cluster of Asian restaurants and grocery stores on Convoy Street (north of Balboa) for lunch. Eleanor found two major Asian grocery stores and happily began hunting for specialties such as Vietnamese coffee, brown seaweed, and noodles. We haven’t yet found an equivalent store in Tucson, so it was time to stock up. In the afternoon we went to the Old Town district to roam around, and visit Bill at the historic Whaley House. He was in one of his many alternate personalities, welcoming visitors to the house and telling the tale of its ghosts (among other things). Having seen Bill as a plague doctor, a train conductor, a lighthouse keeper, and now a 19th century resident of San Diego, I begin to wonder …do I really know who he is? On Tuesday our outing was to Balboa Park, which in my opinion is one of San Diego’s very best attractions. The park includes several wonderful museums, fantastic architecture, beautiful landscaping, and lots of places for kids to play. Being the first Tuesday of the month, the Reuben Fleet Science Museum was free, so we dropped in there. We also took in a relaxing late afternoon cup of tea and mochi (a type of ice cream) at the Japanese tea garden. Just before sunset we hopped over the bridge to Coronado Island to walk the beach near the famous Hotel Del Coronado. This enormous wooden structure is one of the most gorgeous landmarks in America, and a great photographic subject. Parking at the hotel is outrageously expensive, but metered spaces are available just across the street. After dark, I got a few shots to add to my growing neon collection. Wednesday I got buried by work and so we didn’t get out until mid-afternoon. But we still found time to go to the North Park area and drop in on George’s Camera. It’s one of those great full-service camera shops with lots of inventory that are nearly impossible to find today. I finally bought a super wide-angle lens for photographing trailer interiors. I got the newly-introduced Tamron 10-24mm f3.5, which I am now testing. I’m not entirely convinced it was the right buy, but it may work out fine with some practice. North Park is a lively shopping district with lots of cafes and neon, so after a coffee and dessert break (creme brulee for E&E&me, carrot cake for Brett) I added to my neon collection again. If we could have stayed later, the picture would have been much more interesting. But we had an appointment at 6 p.m. up in Encinitas, to join the Moonlight Beach Strummers for a uke jam at a local pizza place. Our friend Tommy G was the guy who really got me started on the ukulele, almost exactly one year ago in Borrego Springs. He pushed me hard for three days in the desert, and was a great encouragement. 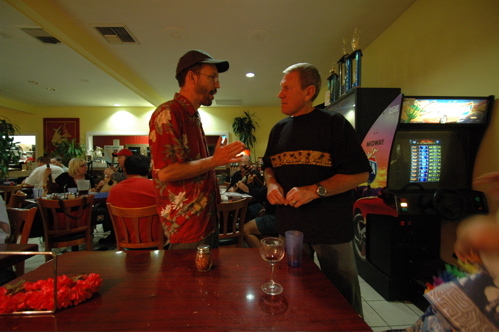 So I’d been looking forward to seeing him again in Encinitas to show him how I’ve progressed. Playing with the group — mistakes and all — made me feel like I was on my way to becoming a real ukulele player. The uke jam was, for me at least, a blast. 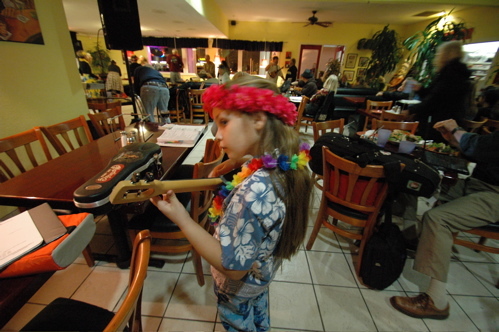 I think Emma liked it too (she brought her uke also, but wasn’t up to speed to play along with most songs). Eleanor and Brett tolerated it kindly from a table in the corner. The turnout was light but still there were dozens of players attending. A group of women danced the hula while a six-piece band led us all in playing Hawaiian tunes until 8:30. We all wore our Hawaiian shirts and ate pizza, and played and listened. I wish I had a group like this in Tucson. Maybe I’ll start one. Thursday was our day for the famous San Diego Zoo, also located at Balboa Park. This is a world-class place, worth a full day (and with a price tag to match). This time of year the weather can turn from sunny and warm to foggy and cold in a very short time, which is precisely what happened to us. Still, we stayed to nearly closing time and had a fabulous day. Emma’s high point was being kissed by a sea lion. On Friday we’ll be relocating to a county park further north. We have no particular plan. For the next few days we are going to wing it, with no itinerary until Monday. This is one of the great aspects of traveling this way: we are free to roam without worries about hotels, rental cars, or airline schedules. Our activities of the past week are perhaps not what people typically associate with “RV’ing” but that’s exactly the point of this blog. RV travel is not just about “camping” but also about freedom. We haven’t sung campfire songs or toasted marshmallows this week, but we’ve had a heck of a good time. We will be looking forward to some ukulele tunes from you and Emma the next time you pass through! Sounds like lots of fun! Rich, please note the new email address change. We still dream of the day we can go back to Little Italy in San Diego for THE BEST CANNOLI IN THE UNIVERSE. Hands down, they are the best!!! We have pined away for it for years since our last visit. Go to Cafe Zucchero on India if you get the chance. You will not be disappointed! Eat a cannoli or 6 for me! They also have awesome gelato. Oh man… so near yet so far away…. we are up at Point Reyes right now, it may well be worth the drive down now that I am really thinking about it! Maybe we will see you there! Lol! It’s fun watching Emma grow up. She looks more like her mama every day. I love San Diego! Wish we were there. I agree–Emma looks more like Eleanor every day~ Gorgeous, eh?